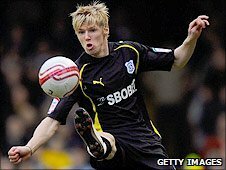 On-loan Cardiff City striker Andy Keogh has moved to Bristol City after being recalled by parent club Wolves. The 24-year-old headed to the Welsh capital last August after signing a season-long deal but has been restricted to just 18 appearances. Wolves hope the forward will play more matches at Ashton Gate, where he has signed a three-month loan deal. Meanwhile, Wolves have signed former Bristol City keeper Adriano Basso, 25, on a short-term deal. Keogh, who joined Wolves from Scunthorpe United in 2007 for £600,000, scored 23 goals in 88 games for Mick McCarthy's men. He bagged two crucial goals for Cardiff to secure a 2-1 win over Millwall and a 1-1 draw with Preston. Keogh, who started at Leeds and had a short spell on loan at Bury in 2005, has also won 14 caps for the Republic of Ireland. Basso, who has been a free agent since leaving Ashton Gate in March 2010 , having made over 200 appearances for City. Having has recently been training with Wolves, he will provide experienced goalkeeping back-up for Wayne Hennessey and Marcus Hahnemann at Molineux.